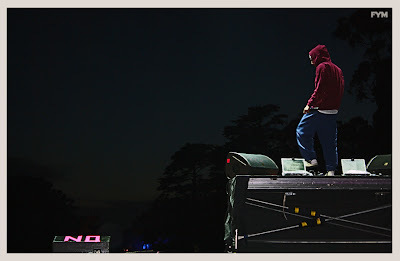 SPENT TIME IN OUTSIDE LANDS PART TWO: Our second day of press coverage at Outside Lands this year was filled with surprises. On that Saturday afternoon (into the evening) the people around us, as well as the incredible music being performed- easily made this our favorite day of the event. The article below spotlights a few of those memorable moments. Cheers, FYM. OUTSIDE LANDS 2011 DAY TWO: Last Saturday, still recovering from the massive menu of sonic bliss FYM took in on day one- we made our way past the festival gates, through a noticeably larger early-afternoon crowd en route to the press tent. 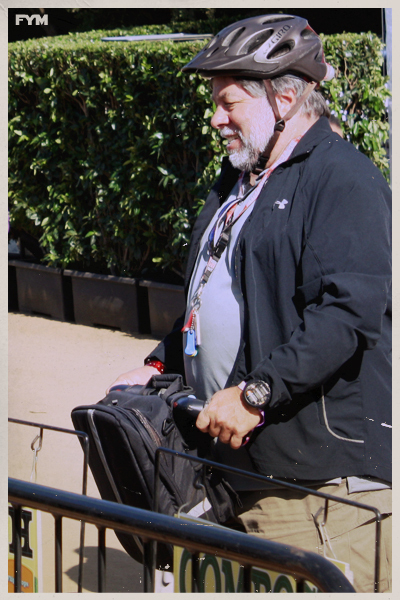 While in the back, getting our batteries charged for the day, we noticed Co-founder of Apple Computer Company, Steve Wozniak, (pictured above) rolling steady on his tricked out Segway. Other press access highlights included our brief conversation with OK Go bassist Tim Nordwind! 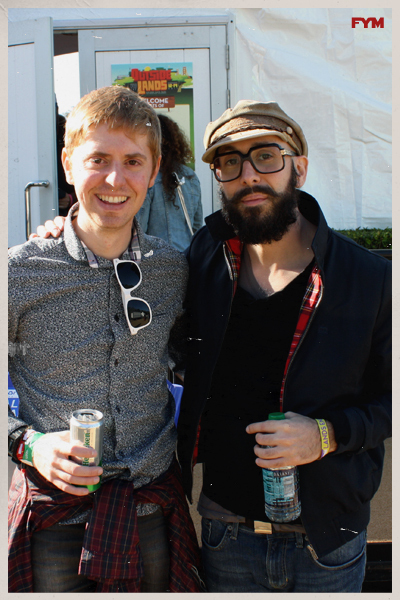 FYM publicist Nick Codling is pictured above hanging with Nordwind after OK Go's impressive main stage performance on Saturday afternoon. COSMIC CONNECTION: This Art Director also had the pleasure of reuniting with our nashviLLe singer/songwriter/comrade rayLand Baxter. He came to S.F. fresh off his successful summer tours with The Civil Wars (with sold out shows across the country), followed by dates with Grace Potter and the Nocturnals. rayLand was flown out to San Francisco for the weekend taking advantage of the good energy in the park- there to support his people at Red Light Management. You may remember Baxter stayed at FYM HQ in Seattle earlier this summer for three days while kicking off his tour with The Civil Wars (Click HERE to read about that situation). 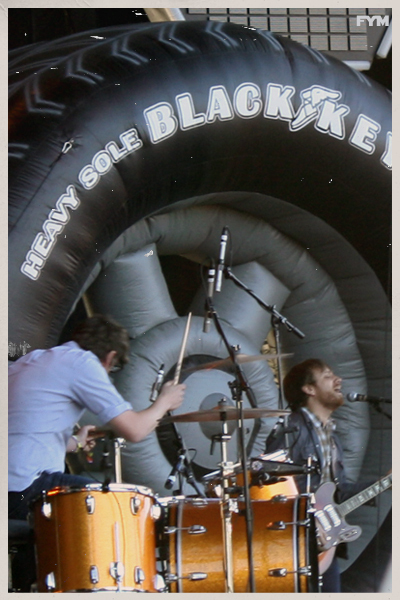 The Black Keys were one of the few bands to add props to their stage presence- with a large blow-up Arkon Ohio Good Year tire (dawning their name) looming over the duo. 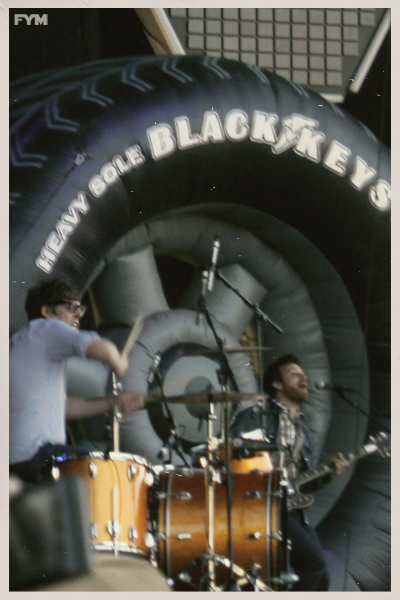 The Black Keys proved all those years of touring makes for a great live band in any setting (intimate clubs or large festival crowds). 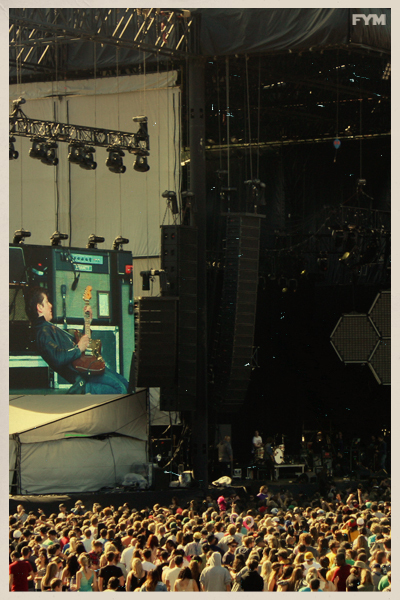 Their hard-hitting rocked up version of the blues went over tremendously well with the Golden Gate crowd. The follow-up to their Grammy Award winning Brothers album is expected later this year. 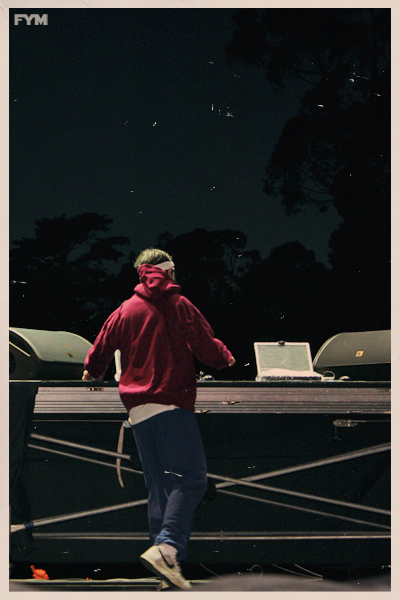 Following The Black Keys set, we made our way over to the opposite side of Outside Lands were FYM caught the magic of The Legendary Roots Crew live on the Twin Peaks stage. 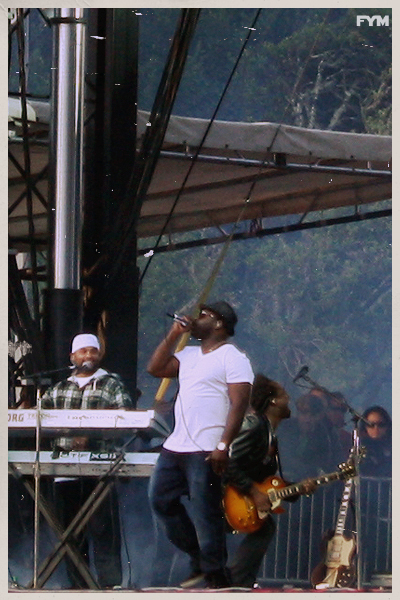 Following the success of 2010's How I Got Over, The Roots are planning on releasing a new record later this Fall. After The Roots closed out their jam session and the sun sank past the horizon- FYM found themselves invited backstage watching Gregg Gillis (Girl Talk) orchestrating a furious boogie-down sonic mashing showcase. Since Gillis can't necessarily make money from selling records due to copyright issues of merging so many samples together (even if he is creating something entirely new) so it's no surprise he makes his money on the road throwing these massive parties on stage. 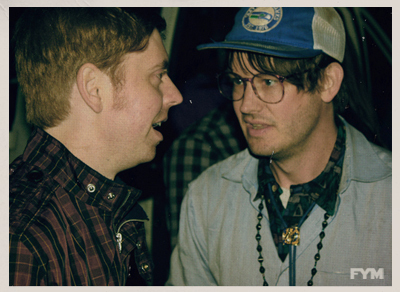 Other highlights of being backstage for Girl Talk was running into Josh Hodges of Starfucker (Portland Electronica). 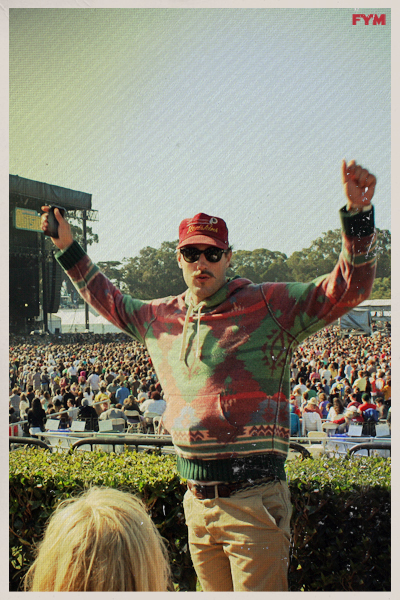 Hodges pictured above with FYM's publicist- was kind enough to give us his Outside Lands meal ticket for the night. 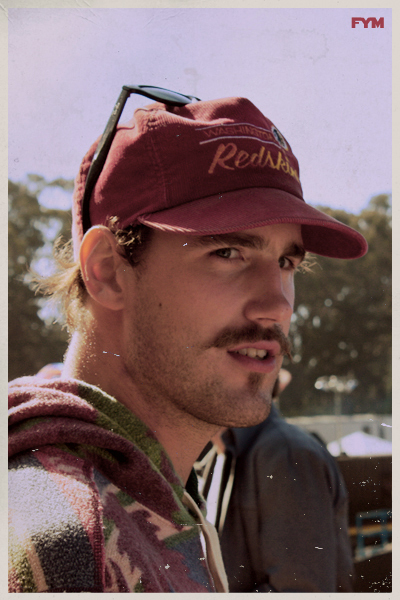 As Day Two came to an end this Art Director parted ways with the FYM crew and met back up with rayLand Baxter. We found ourselves a few baked goods for the road and waited for a bus to take us downtown. Pictured Above: Baxter is always willing to help a lady with her hair.. 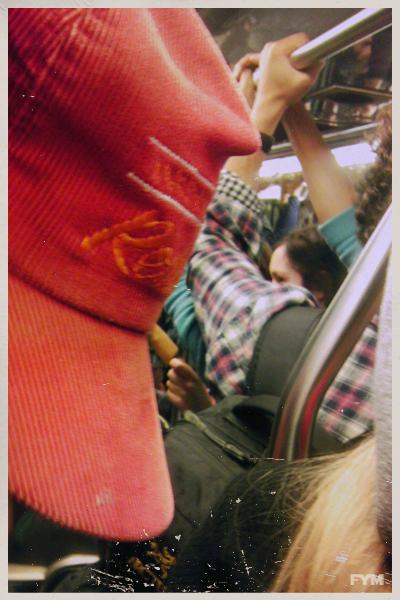 It was magic- people making an uncomfortable situation beautiful. The entire bus came together for a epic sing along of Queen's Bohemian Rhapsody. It was an amazing/surreal moment to experience. After a long public transit ride Baxter and I made our way to the 39th floor of the Marriott Hotel. I found myself sipping on Jim Beam and water (rayLand's choice), taking in incredible views of the city at night, and entertaining random conversations with the group of people Baxter had come to see. 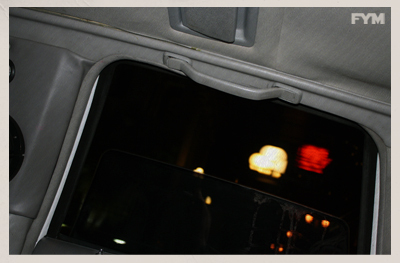 As we left the hotel back to where my Nashville friend was crashing, it became evident the cab situation was non-existent at this time of night. And just then a limo pulled up, Baxter said something to the effect of you wanna get a ride from the limo? I'll take care of this... and we did. It was approximately 2:30 in the morning in the heart of San Francisco, feeling well-marinated in the back of a limo (my first ever time riding in one, as seen above) en route to rayLand's friends house, after a long day of music and partying, that it occurred to me- this is what it must feel like to be a rockstar. 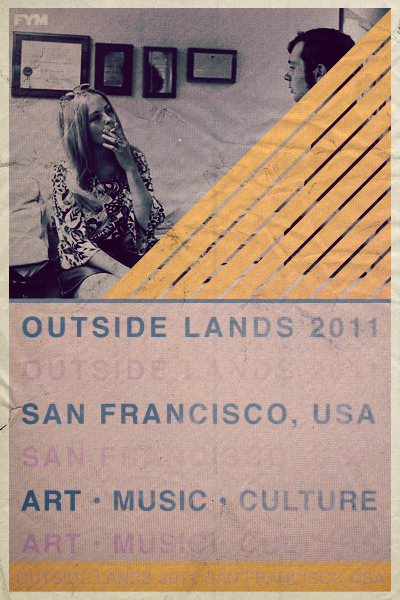 A special thanks to Outside Lands 2011, the beautfiul people of San Francisco, and rayLand for making Day Two an experience forYoungModerns will never forget.